It's worth noting that roller coaster rankings vary. Parks continually try to outdo one another with the tallest, fastest, longest or steepest coasters. In other words, while these may be record-holders right now, they won't be for long. Kingda Ka is a steel accelerator roller coaster located at Six Flags Great Adventure in Jackson, New Jersey, United States. It is the world's tallest roller coaster, the world's second fastest roller coaster, and was the second strata coaster ever built. It was built by Stakotra, a subcontractor to Intamin. Plans to build Kingda Ka were announced on September 10, 2004, at an event held for roller coaster enthusiasts and the media. The event revealed the park's goal to build "the tallest and fastest roller coaster on earth", reaching 456 feet (139 m) and accelerating up to 128 miles per hour (206 km/h) in 3.5 seconds. On January 13, 2005, Kingda Ka's tower construction was completed, and on May 21, 2005, the ride opened to the public. Kingda Ka became the "tallest" and "fastest" roller coaster in the world, taking both world records from Top Thrill Dragster at Cedar Point. It lost the title of world's fastest when Formula Rossa at Ferrari World opened in November 2010. Intamin designed both Kingda Ka and Top Thrill Dragster, and the two share a similar design and layout that differs primarily by the theme and the additional hill featured on Kingda Ka. Both rides were built by Stakotra and installed by Martin & Vleminckx. On August 29, 2013, Six Flags Great Adventure officially announced Zumanjaro: Drop of Doom for the 2014 season. The new attraction was attached to the Kingda Ka coaster. The drop tower features three gondolas integrated into the existing structure which was also built by Intamin. Kingda Ka closed at the start of the 2014 season in order construct Zumanjaro: Drop of Doom on to Kingda Ka. Kingda Ka reopened on weekends on Memorial Day Weekend and fully reopened when Zumanjaro: Drop of Doom was completed on July 4, 2014. Kingda Ka's layout and experience is nearly identical to Top Thrill Dragster. After the train has been locked and checked, it moves slowly out of the station to the launch area. It passes through a switch track, which allows four trains (on two tracks) to load simultaneously. When the signal to launch is given, the train rolls back slightly (to engage the catch car) and the brakes on the launch track retract. There is a voice that says, "Arms down, head back, hold on". The launch occurs five seconds after the hissing sound of the brake fins retracting or the warning voice. Kingda Ka's horn previously sounded before each launch, but it was silenced due to noise complaints from nearby residents; the horn now sounds only when Kingda Ka first launches after being idle for a length of time. When the train is in position, the hydraulic launch mechanism accelerates the train from 0 to 128 miles per hour (0 to 206 km/h) in 3.5 seconds. At the end of the launch track, the train climbs the main tower (or top hat) and rolls 90 degrees to the right before reaching a height of 456 feet (139 m). The train then descends 418 feet (127 m) straight down through a 270-degree right-hand spiral. The train climbs the second hill of 129 feet (39 m), producing a moment of weightlessness before being smoothly brought to a stop by the magnetic brakes; it then makes a left-hand U-turn and enters the station. The ride lasts 28 seconds from the start of the launch. Kingda Ka is themed as a mythical tiger, named for the 500 lb (230 kg) Golden Tabby Bengal tiger who lived in an adjacent exhibit before moving to the park's safari. The ride's sign and station have a Nepalese style. The queue line is surrounded by bamboo, which augments the jungle theme. Jungle music is played during the wait and throughout the Golden Kingdom section of the park, which was built for the ride. The hydraulic launch motor is capable of producing 20,800 peak horsepower (15.5 MW). Because of the high speed and open nature of the trains, the ride will not operate in light rain. Kingda Ka's four trains are color-coded for easy identification (green, dark blue, teal, and orange) and are numbered; the four colors are also used for the seats and restraints. Each train seats 18 people (two per row). The rear car has one row, while the rest have two. The rear row of each car is positioned higher than its front row for better visibility. Each of Kingda Ka's trains has an extra row of seat mounts. The panels could be removed for the installation of additional seats in the future. This modification would increase the capacity of each train from 18 to 20, and the hourly capacity of the coaster from 1400 to 1600 riders per hour. Kingda Ka's station is prepared for this modification, with entrance gates for the currently-nonexistent row of seats. Kingda Ka's over-the-shoulder restraint system consists of a thick, rigid lap bar and two thin, flexible over-the-shoulder restraints. Because the over-the-shoulder portions of the restraint are not rigid, the hand grips are mounted to the lap bar. Kingda Ka's restraints are also held down by a belt, in case the main locking system fails. To speed loading, riders are asked to secure their own restraints if possible. Kingda Ka's station has two parallel tracks, with switch tracks at the entrance and exit. Each of the station's tracks is designed to accommodate two trains, so each of the four trains can be operated from its own station. While all of the trains are mechanically identical and able to load and unload at each of the four individual station bays the original plan was for all trains to operate at the same time and for each train to load and unload at their own station. During normal operation, trains on one side are loaded while trains on the other side are launched. When both sides of the station are in use an employee directs riders in line to go to a particular side, where they can choose to sit in the front or rear of the train. During recent seasons it has become common that only one train bay (the forward one on the side opposite of the parking lot) be used for the loading, unloading, and dispatching of trains and that the other train or trains in operation on any given day wait either in the station behind a loading/unloading train or outside of the station on the brakes that follow the second hill. Two operators load, check and dispatch each train; another launches the trains. Kingda Ka's music is by Safri Duo; almost their entire Episode II album is played in the queue and station. The other is the remix version of Survivor's "Eye of the Tiger", played by DJ Quicksilver. Both of these may be heard during the queue and in the station. A train may occasionally experience a rollback following a launch. A rollback occurs when the train fails to make it over the top of the tower and descends back down the side it was launched. Kingda Ka includes retractable magnetic brakes on its launch track to prevent a train from rolling back into the loading station. On June 8, 2005, a bolt failed inside a trough that the launch cable travels through. This caused the liner to come loose creating friction on the cable and preventing the train from accelerating to the correct speed. The rubbing of the cable against the inside of the metal trough caused sparks and shards of metal to fly out from the bottom of the train. The ride was closed for almost two months following the incident. Damage occurred to the launch cable which was frayed and required replacement, to the engine including minor damage to seals, and to many of the brake fins. The brake fins in the launch section are mounted to keep fast-moving trains from moving backward into the station. However, the fast-moving train being pulled forward caused an unexpected stress on a number of fins bending them forward. Not all required replacement, but there were more damaged brake fins than Six Flags had replacements for. Extra brake fins had to be ordered from the manufacturer, Intamin in Switzerland, and the ride had to undergo thorough testing following the repair. Kingda Ka reopened on August 4. Kingda Ka was struck by lightning in May 2009 and suffered serious damage. The ride was closed for three months while being repaired and reopened on August 21, 2009. On August 27, 2011, Kingda Ka suffered unspecified damage shortly before Hurricane Irene. On Saturday, August 27, Six Flags Great Adventure did not open due to the approaching hurricane. 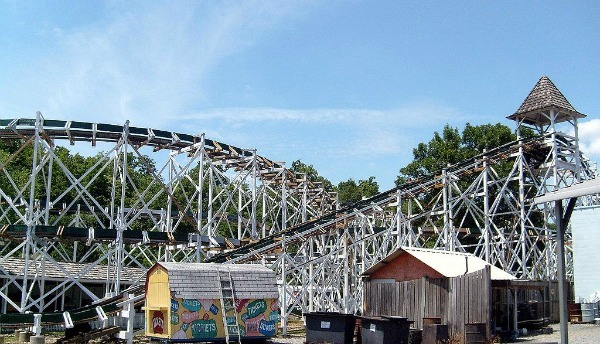 While it is unknown whether additional damage occurred due to the storm, the coaster was damaged to the extent that it could not run before Irene. Kingda Ka remained closed until the start of the 2012 operating season on April 5. Shortly before 5:00 pm on July 26, 2012, a young boy was sent to the hospital after suffering minor injuries from being struck by a bird during normal operation. The ride resumed normal operation shortly after the incident. Colossos is a wooden roller coaster at Heide Park in Soltau, Lower Saxony, Germany. Unlike traditional wooden roller coasters, Colossos was prefabricated, meaning the track was laser cut in a factory to achieve a higher degree of precision. The sections were designed to snap together like Lego pieces. Some of the wooden planks were tightly bonded together in multiple layers instead of being traditionally nailed together by hand. The "Plug and Play" aspect of the coaster sped up construction and lowered building costs by reducing the amount of labor required. Three other prefabricated wooden roller coasters have since been built: Balder at Liseberg, El Toro at Six Flags Great Adventure, and T Express at Everland in South Korea. Since July 28th 2016. The coaster ceased operations and will not be open at all for the 2017 season. Since then, all paths to the coaster have been blocked off. Steel Dragon 2000 (スチールドラゴン2000 Suchiiru Doragon Nisen?) is a roller coaster at Nagashima Spa Land amusement park in Mie Prefecture, Japan. Built by Morgan Manufacturing, this coaster opened, appropriately, in 2000—"The Year of the Dragon" in Asia. It debuted 3 months after Millennium Force at Cedar Point, and surpassed that as the world's tallest complete-circuit coaster. It lost these records in height in 2003 when Top Thrill Dragster opened at Cedar Point. It also took the record for the longest track length—2,479 metres (8,133 ft)—which it currently holds. 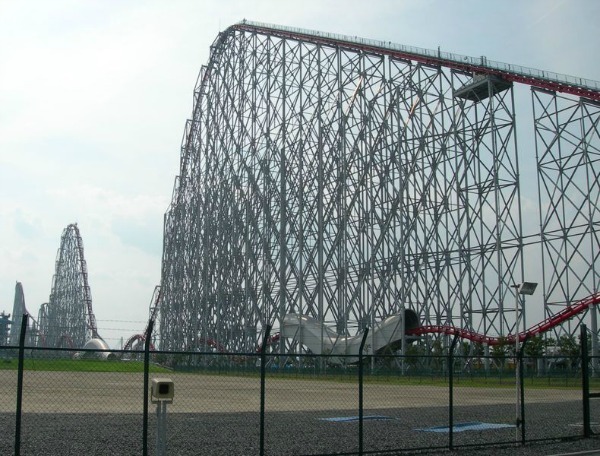 The ride is the second fastest coaster in Japan and the sixth fastest in the world. In 2013, the ride's Morgan trains were removed and replaced by new trains manufactured by B&M (Bolliger and Mabillard). In August 2003, a sheared axle caused one of the trains to lose a wheel. A passenger suffered a serious back injury and a 28-year-old man swimming in the water park pool was injured when he was hit in the hip with the 32 cm wheel. The ride was "Standing But Not Operating" (SBNO) for almost three years and reopened in 2006. The building of Steel Dragon 2000 required far more steel than other coasters for earthquake protection. This put the cost of the coaster at over $50 million. In 2013, Steel Dragon 2000 received new trains from Bolliger & Mabillard. The ride includes two tunnels. The Beast is a wooden roller coaster located at Kings Island in Mason, Ohio. Built in-house, it opened in 1979 as the tallest, fastest, and longest wooden roller coaster in the world. The Beast has remained the longest wooden coaster in the world at 7,359 feet (2,243 m) and spans more than 35 acres (14 ha) utilizing the surrounding terrain for many of its elements. It also features one of the longest ride times that lasts more than four minutes. Originally, Kings Island wanted to re-build a replica of the Shooting Star roller coaster previously located at Cincinnati's Coney Island. Coney Island was Kings Island's predecessor, and the Shooting Star was immensely popular there before it was demolished in 1971. The idea to rebuild the Shooting Star was eventually shelved in favor of building a terrain roller coaster that utilized the park's naturally occurring wooded hills. The Shooting Star was eventually rebuilt at Canada's Wonderland as a replica called the Mighty Canadian Minebuster. The Beast opened on April 14, 1979, as the tallest, fastest, and longest wooden roller coaster in the world. 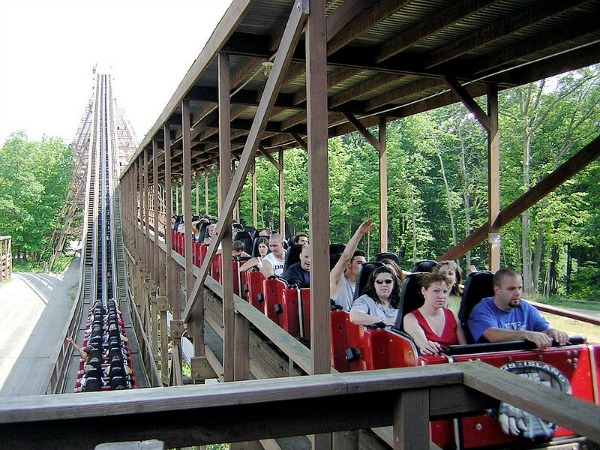 It is often credited as the first modern-day wooden roller coaster to generate a marketing campaign. From elaborate animated commercials to countless television spots, the ride eventually became famous worldwide. The Beast originally featured three underground tunnels. By its second season, the second and third underground tunnels were joined. Also after its first season, two enclosed tunnel structures were added to the double helix finale, one of the most well-known features of the ride. Kings Island’s Director of Construction, Maintenance, and Engineering Charles Dinn oversaw the ride's construction and later formed his own construction firm in 1982. Originally called the Dinn Corporation and later known as Custom Coasters International, the construction firm went on to build more than a dozen roller coasters across the United States. In 2000, the park opened a successor to The Beast, Son of Beast, which became the tallest and fastest wooden roller coaster in the world. It was also the first modern-day wooden coaster to feature an inversion, a vertical loop that was removed in 2006. Son of Beast was designed to break several world records, but one it did not attempt to break was ride length. As a result, The Beast would retain its world record for longest ride time. The Son of Beast was later dismantled in 2012. It is commonly mistaken that the Philadelphia Toboggan Company (PTC) was heavily involved in the roller coaster's construction and design, since The Beast uses the same PTC trains that The Racer uses. In reality, the trains were the only part of the ride that PTC had a hand in. Primary design and construction was handled internally by Kings Island. Part of the design and engineering work was subcontracted to Curtis D. Summers Engineering, a structural engineering and architecture firm located in Cincinnati. Summers' team worked with in-house designers Al Collins and Jeffrey Gramke as well as John C. Allen who provided profiling and dynamics specifications. The ride begins with the train making a 180-degree turn out of the station, traveling near Vortex's first drop and through a switch track, which provides the option of diverting trains to a covered storage area. Riders take a slight left turn into the first lift hill and slowly climbs 110 feet (34 m). At the crest, the train travels down a 135-foot drop (41 m) into an underground tunnel, passing an on-ride camera. The train comes out of the first drop still underground. Out of the tunnel, the train makes a hard left-hand turn, maneuvers the climb and drop of a second hill giving riders momentary weightlessness. The train then climbs upward, makes a right turn, and speeds into a covered brake shed. Once through the trim brakes, the track turns to the right, continuing through a heavily wooded area. Veering left, the track enters the second tunnel. A quarter of this tunnel is underground, while the exit is above. This is due to the topography of the land (in the early years of the ride this section of track was two tunnels that went underneath a service road; shortly after opening, the section of track between the two tunnels was covered over). As the train exits the tunnel, the train gains speed veering right, then taking another hard turn to the right. The track goes downhill, then rises uphill and hits a trim brake. The train then goes down a gradual descent and climbs the second lift hill. At the top of this lift, the train turns left and begins a gradual, 18-degree drop. 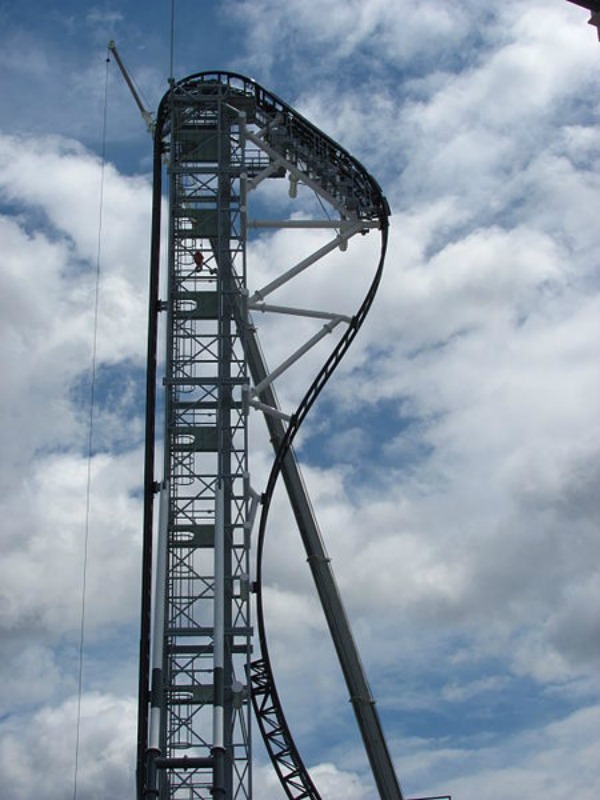 The drop itself measures 141 feet (43 m) from the crest of the lift hill to the lowest point of the helix. As the train descends, the track starts to bank left in preparation for entrance into the final helix. The highly banked, high speed, counter clockwise helix is the signature trademark of the ride. Half of this massive double helix is enclosed, which adds to the intensity and excitement. Once through this element, the train crests another small hill, then rises into the final magnetic brake run back to the station. Amusement park and roller coaster enthusiasts are always excited when they hear about records being broken on new coasters and rides. They always want to know what the tallest coaster is and which is the fastest coaster. Many enthusiasts probably know that the tallest coaster in the world ( for now) is Kingda Ka at Six Flags Great Adventure. Many, however, do not know that the fastest coaster in the world is Formula Rossa at a theme park called Ferrari World in Abu Dhabi, UAE. 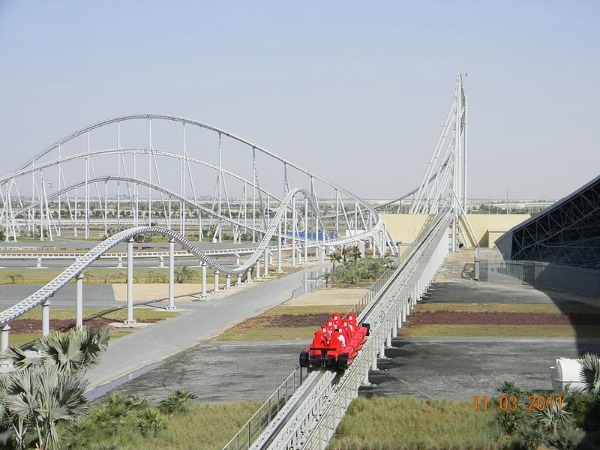 Formula Rossa is a launched coaster that was built by Intamin and installed into the park in November of 2010. The coaster reaches a top speed of 150 mph which beats out Kingda Ka. The coaster is hydraulically launched and reaches its top speed in less than 5 seconds. The same technology that went into this coaster is also found on aircraft carrier steam catapults. Not only is the coaster fast, but it is also very long. The track is the sixth longest in the world at almost 1.5 miles. The coaster was inspired by the famous Itallian racetrack called Autodromo Nazionale Monza. Riders are supposed to feel what its like to be in a Formula 1 car at high speeds. The speed is so fast that riders must wear safety goggles during the ride so that insects and other projectiles do not injure you. Now, let us take a virtual journey on the fastest coaster in the world. Buckle in and hold on tight. As riders enter the queue line for the ride, you are given a wonderful view of the red and white glass tiled indoor amusement park. As you reach the station, you notice the same design on it as well. You will enter a train that looks like a Formula 1 racecar. You sit down, strap in, put on your goggles, and get ready for launch. The train pulls out of the station and slowly stops at the starting line on the white steel track. The red lights above count down from 5. As the last red light shines, the top lights turn green and you launched. You reach a top speed of 150 mph on a straight stretch. At the end of the stretch the train then ascends a 174 foot hill that slows the speed down and then immediately into a high banked left hand turn that is very long. As you come around, the train then banks the opposite direction and into a high left banked turn that takes you back the opposite way. The train now flips again to a right banked helix that brings you back toward the station. The train now goes over two small airtime hills and into the final break run that is magnetically halted. As you come back into the station, you check to see if you are covered in bugs and realize you have just ridden the fastest coaster in the world. The next time you visit the beautiful country of the United Arab Emirates, make sure a stop in Abu Dhabi is on your list so that you can visit Ferrari World and ride Formula Rossa. The Smiler is a steel roller coaster located at Alton Towers in Staffordshire, United Kingdom. Manufactured by Gerstlauer, it features 14 inversions and holds the world record for most inversions on a roller coaster. The Smiler has suffered a series of setbacks and ride incidents including a malfunction at a press preview event which delayed the official opening date to 31 May 2013. On 2 June 2015, two of the ride's trains collided leaving five riders seriously injured. An investigation by the HSE was initiated, and the ride was closed for the remainder of the season. The ride eventually reopened on 19 March 2016 for the start of the new season. It is said that after the ride opened to the public it included better safety standards that would prevent a collision from ever happening again. Plans to build The Smiler were submitted to the local authority in December 2011. Permission was granted on 15 March 2012 following a Staffordshire Moorlands Council meeting, despite some local opposition to its construction. Gerstlauer, a German manufacturing company, was hired to build the roller coaster. Less than a month after obtaining permission, Alton Towers launched a website announcing a new ride – codenamed Secret Weapon 7 (SW7) – for the 2013 season. Its codename followed a similar format used for other roller coasters during their teaser campaigns, such as SW4 for Oblivion and SW6 for Thirteen. In June 2012, a trademark filed by Merlin Entertainments, parent company of Alton Towers, hinted that the new ride would be named The Smiler. On 17 October 2012, a number of facts about the coaster were revealed to the public including its maximum speed, track length, ride time, passengers per train and ride cost. Despite the release, Alton Towers did not announce or confirm the name for the ride. The site for the new ride was determined to be an area in the park being occupied by the tent that previously contained the Black Hole, a roller coaster which closed after the 2005 season. The park began dismantling the Black Hole on 12 April 2012. The first pieces of track arrived at the park in late October 2012. Sections of track were later moved to the construction site on 6 December 2012. In January 2013, Alton Towers officially confirmed that the ride would be called The Smiler. In February 2013, the park revealed some of the ride's elements. The trains arrived in March 2013, as Alton Towers began posting images on both Twitter and their official Smiler website. Vertical construction was completed approximately one month later, as the final piece of track was installed at the top of the first lift hill. Initially, The Smiler was expected to make its public debut in March 2013 for the park's opening day, but due to construction delays, the date was pushed back to 23 May 2013. The date had to be pushed back further after technical issues were encountered during testing and a ride incident occurred during its preview event that stranded riders on the lift hill. Following the incident on 17 May 2013, Alton Towers explained on their website that The Smiler would not open on the originally scheduled date due to "unforeseen teething problems." The ride's delayed opening initially caused controversy as many had booked advance tickets and stays at the Alton Towers Hotel in order to be among the first to ride the coaster. However, Alton Towers later announced it would allow those who had made advanced bookings to change their tickets and hotel reservations free of charge. The Smiler eventually opened on 31 May 2013. The ride has been known for a number of significant structural and technical issues since its launch. The most serious incident occurred on 2 June 2015, when a loaded train collided with an empty test train, causing serious injuries to a number of riders. Subsequently, Merlin Entertainments decided to close The Smiler, Saw – The Ride at Thorpe Park, and two other roller coasters at Chessington World of Adventures (all of which have since reopened) while safety protocols and procedures were evaluated. The Health and Safety Executive (HSE) served a Prohibition Notice upon the Smiler, preventing the ride's use until remedial action had been completed. On 27 July 2015, it was stated by Merlin Entertainments chief executive Nick Varney that The Smiler would "not be opening this summer". The Health and Safety Executive (HSE) has initiated a criminal investigation that will focus on the actions of two employees – a ride engineer and a ride operator – who may have failed to follow basic safety protocols leading up to the accident. In the incident's aftermath, Alton Towers and its owner Merlin Entertainments have seen a drop in revenue and visitor numbers, which has contributed to the decision to make up to 190 job redundancies at the theme park. Six rides were closed during the 2016 season as a result of the crash. This has been a terrible incident and a devastating day for everyone here. We have a very strong record of safe operation of our rides here at Alton Towers and it is our priority. I would like to express my sincerest regret and apology to everyone who suffered injury and distress today and to their families. The ride eventually reopened on 19 March 2016 for the start of the 2016 season with additional safety features. Merlin Attractions Operations Ltd was prosecuted by the HSE at North Staffordshire Justice Centre on 22 April 2016, in which the firm pleaded guilty, and was sentenced to a £5 million fine on 27 September 2016 after a two day hearing at Stafford Crown Court. Leap the Dips is a National Historic Landmark and the world's oldest operating roller coaster. The ride was closed in t1985 and was almost destroyed, but preservation efforts helped to restore this coaster for future generations. Built at in 1902 by the E. Joy Morris Company, this historic wooden roller coaster reopened on Memorial Day 1999. Leap the Dips is now one of only a few remaining side-friction wooden roller coasters in existence today. 1902 - 1985 - Leap-The-Dips original dates of operation. 1999 - Leap-The-Dips reopens after an extensive restoration. This coaster stood without operating for 13 years. Four passenger cars have two rows, seating two abreast per row. Montaña Suiza ("Swiss Mountain") is a steel scenic railway roller coaster located at Parque de Atracciones Monte Igueldo, on the coast at Donostia/San Sebastián, Spain. It was designed and built by German engineer Erich Heidrich and opened at the site in 1928. It is the oldest steel roller coaster still operating in the world. 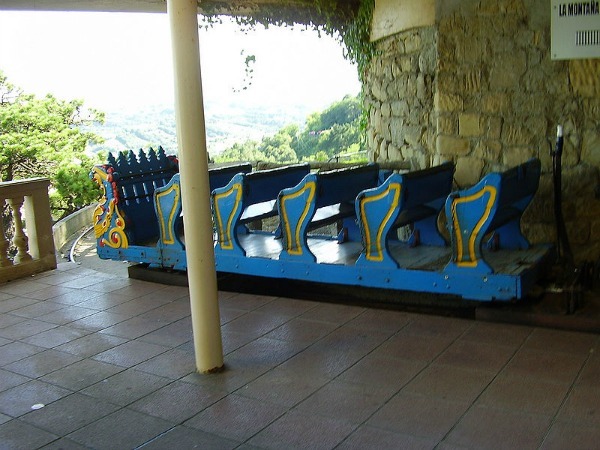 The ride was built with wooden running rails which were in a trough, like usual scenic railways; only the trough is partially set into the landscape and is concrete in construction. The ride lacks the tradition supporting trestles of scenic railways; the track running in depressions made into the ground and along the top of a coastal wall at one point. The running rails have since been changed to steel. The roller coaster operates with two trains, each of which are composed of two 2x5 person cars. The cars are wooden in construction and ride on steel bogies; like scenic railways at Margate, UK, Great Yarmouth Pleasure Beach, UK and Luna Park, Melbourne. A brakeman still rides onboard each train to control its speed. A new rollercoaster in Japan - which will boast the steepest vertical drop of any ride in the world - is set to raise the bar for thrill-seekers. On July 16th, the Fuji-Q Highland Amusement Park, in the shadow of Mount Fuji in Yamanash, will unveil the stomach-flipping Takabisha ride - an attraction that includes seven major twists over 1000 metres of track, and a nerve-jangling drop of 43 metres. The Takabisha, which translates as 'dominant' in English, relies on a combination of gravity and a set of linear motors on the cars. These accelerate the coaster to speeds of 100kmph. Riders experience weightlessness as they 'nosedive' down the sharp incline, before later being plunged into darkness. But there is little time to enjoy the view of snow-capped Mount Fuji. The ride lasts just 112 seconds. Costing an eye-watering 3 billion yen (around £23million) to build, Takabisha will grab the title of 'ride with the steepest incline' from a British attraction, Mumbo Jumbo at Flamingoland in the UK. The popular Yorkshire theme park has held the record since July 2009. Mumbo Jumbo, which cost £5m to design and build, has an incline of 112 degrees and puts riders under a force of 4Gs, similar to those experienced by fighter pilots. Fuji-Q is no stranger to records - this will be the 14th Guinness-recognised mark set by the park. However, when it comes to speed, the world's fastest rollercoaster is still Formula Rossa, which can be found at Ferrari World in Abu Dhabi. This speeds riders around its tracks at 240kmph. Zumanjaro: Drop of Doom is a drop tower operating at the Six Flags Great Adventure amusement park in Jackson Township, New Jersey. At 415 feet (126 m) tall, the ride is attached to the existing Kingda Ka roller coaster and stands as the world's tallest drop tower. 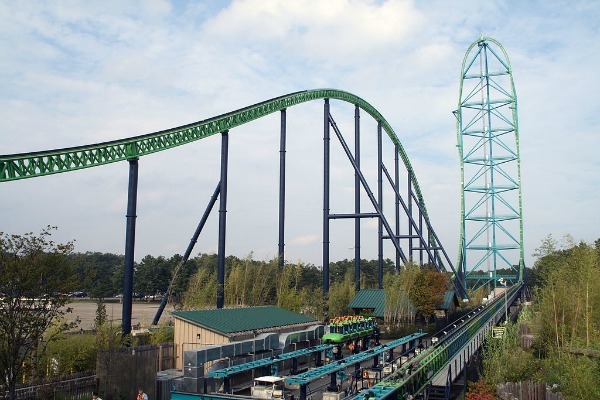 On May 21, 2005, Kingda Ka opened to the public and became the tallest and fastest roller coaster in the world at that time, overtaking both world records from Top Thrill Dragster at Cedar Point. Rumors that Six Flags Great Adventure would be adding a drop tower attached to Kingda Ka, similar to Lex Luthor: Drop of Doom at Six Flags Magic Mountain, emerged in February 2012. In August, theme park enthusiast website Screamscape mentioned that Rolling Thunder may be removed at the end of the 2013 season. 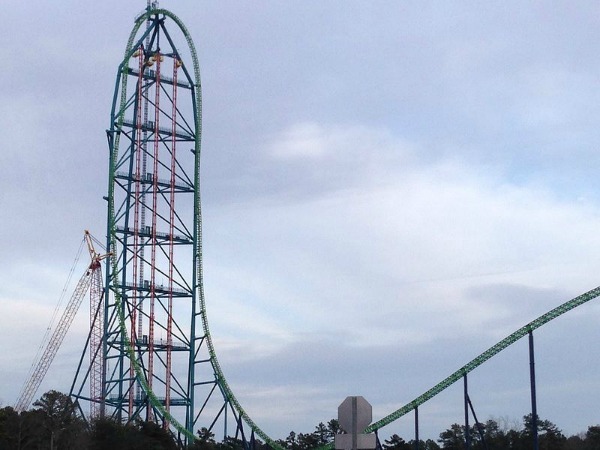 On August 29, 2013, Six Flag's chairman, president, and CEO, Jim Reid-Anderson, officially announced Zumanjaro: Drop of Doom for the 2014 season, which would be attached to Kingda Ka, along with the other new rides to be built at other Six Flags parks. In the press release, it was confirmed that Rolling Thunder would close on September 8, 2013, and be demolished. The new ride is inspired by the park's 2013 addition, Safari Off Road Adventure. The area adjacent to the Zumanjaro: Drop of Doom would be a new habitat for African baboons, which will replace the 2011 addition, Safari Discoveries. On April 1, 2014, the final track piece for the drop tower ride was erected into place by park construction crews. The ride opened to the public on July 4, 2014. Zumanjaro: Drop of Doom was first slated to open originally during the Memorial Day Weekend of 2014. Two weeks before opening the new attraction along with the reopening of Kingda Ka, Six Flags Great Adventure delayed the opening due to the weather during the construction of the ride with its extreme heights. Despite the delayed opening in late May, Kingda Ka reopened only during the weekends of the summer until the opening of the drop tower. On June 26, 2014, Six Flags Great Adventure announced the opening of the new attraction for the Fourth of July holiday weekend. Hours before the soft-opening of Zumanjaro: Drop of Doom on July 2, 2014, the theme park delayed the opening of the drop tower again for the second time. Six Flags Great Adventure stated that the state of New Jersey had not granted the park the operating permit to open the new drop tower. However, two days after the second delayed opening, the park opened the ride to the public on July 4, 2014. Zumanjaro: Drop of Doom consists of three free-fall drop attractions, each mounted to a lateral flank of the Kingda Ka structure. Each of the three towers features a single floorless gondola seating eight abreast. Before riding, riders queue along a new African baboon habitat. Riders are harnessed in by over-the-shoulder restraints. Catch cars hoist the gondolas up the tower before reaching a dynamic height of 415 feet (126 m). The gondolas are then released into a fast free-fall descent, attaining a terminal velocity of 90 miles per hour (140 km/h) for six seconds. Once at the top of the 415-foot-tall ascent, riders, on a clear day, are able to see Philadelphia, which is 52 miles (84 km) away from the park. Opened on July 4, 2014. Zumanjaro: Drop of Doom holds the record for the tallest and fastest drop tower ride in the world, taking the record from Lex Luthor: Drop of Doom at Six Flags Magic Mountain on July 4, 2014. While Zumanjaro: Drop of Doom is the tallest drop tower, it is not the highest by elevation. The highest by elevation is The Sky Drop located atop the 1,492-foot (455 m) high deck of the Canton Tower in Guangzhou, which carries riders 99 feet (30 m) upwards to an elevation of 1,591 feet (485 m) Riders experience the free fall twice, once sat in a staddard gondola, then aa second time but in a stand up tilting gondola. The Sky Drop was built in 2010 by Intamin. Royal College of Art PhD student (and former amusement park employee) Julijonas Urbonas has drafted designs for a project he calls "The Euthanasia Coaster," a fast and fatal thrill ride designed to starve the rider's brain of oxygen. 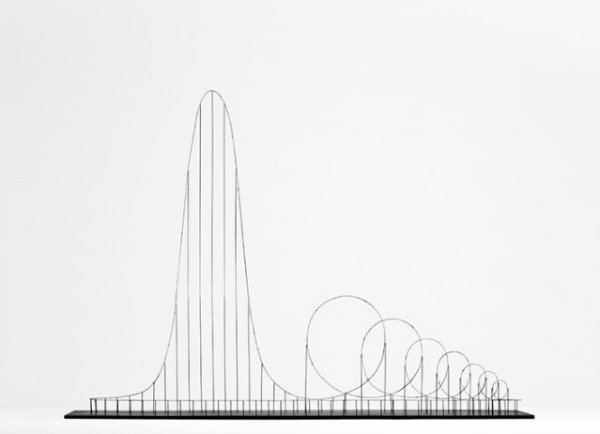 "Euthanasia Coaster" is a hypothetic euthanasia machine in the form of a roller coaster, engineered to humanely – with elegance and euphoria – take the life of a human being. Riding the coaster's track, the rider is subjected to a series of intensive motion elements that induce various unique experiences: from euphoria to thrill, and from tunnel vision to loss of consciousness, and, eventually, death. Thanks to the marriage of the advanced cross-disciplinary research in space medicine, mechanical engineering, material technologies and, of course, gravity, the fatal journey is made pleasing, elegant and meaningful. Celebrating the limits of the human body but also the liberation from the horizontal life, this ‘kinetic sculpture' is in fact the ultimate roller coaster: John Allen, former president of the famed Philadelphia Toboggan Company, once [said] that "the ultimate roller coaster is built when you send out twenty-four people and they all come back dead. This could be done, you know." The Euthanasia Coaster only exists on paper, as I imagine Urbonas would have to cut through some impenetrable red tape before anyone could step right up. Kind of brings to mind the Carousel from Logan's Run, no? 0 Response to "11 Record-Holding Roller Coasters In The World"